The ruins of a rectangular tower built as a hall house and subsequently heavily modified. The structure is unstable and therefore there is no internal access. Notes: Castle Cluggy is found on the northern shore of Loch Monzievaird which is 1.5 miles west of Crieff directly adjacent to the A85. The loch and surrounding grounds are part of a private site of self catering holiday homes. Residents and guests can park adjacent to the relevant lodge. CastlesFortsBattles.co.uk cannot advise on rights of access for non-residents but note there is a car park on the A85 just a few hundred metres from the estate entrance. To visit the castle simply follow the loch side path. 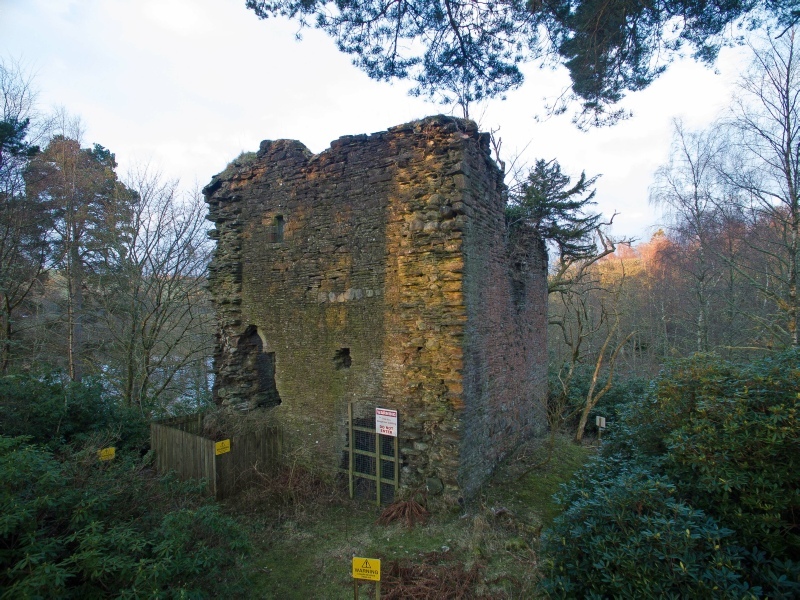 Castle Cluggy was built on a promontory of land overlooking Loch Monzievaird. Originally built as a Hall House, it was later extensively modified and converted into a square tower. Ownership of the site was the subject of an extended feud between the Drummonds and Murrays until it was eventually settled in favour of the latter. Cluggy Castle is sited on a steeply scarped mound situated on a promontory (known as the 'Dry Isle') that juts out into Loch Monzievaird. 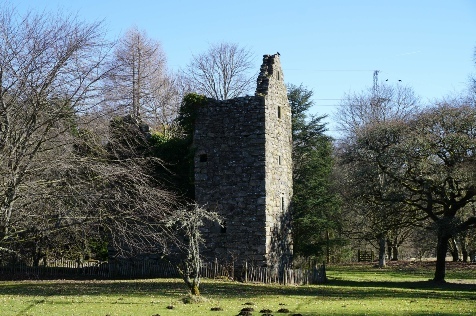 Little is known about the early history of the castle but in 1005 the Battle of Monzievaird was fought nearby between the forces of Malcolm II and Kenneth III. It is possible some form of residence had been established on the Dry Isle by this time. The first known fortification however dates from the fourteenth century when a rectangular hall was built on the site. The earliest surviving record refers to it as antiquum fortalicium (ancient fort) further implying a long history of occupation. The castle ruins seen today are from a three storey rectangular tower clearly built with defence foremost in mind; the walls are 1.5 metres thick whilst the windows were few and little more than slits. Today the remains are around 7 metres square but originate from the earlier hall; at an unknown date the eastern section of the tower was demolished and an internal wall, just 1 metre thick, became the eastern external wall presumably to convert the structure into a more fashionable Tower House. Perhaps due to its conversion from a hall house, the tower had no ground floor vaulted chamber and instead all floors were supported by timber beams secured in joist holes. By the early fourteenth century the site was owned by John Comyn, Lord of Badenoch (Red Comyn) but following his murder (by Robert the Bruce at Dumfries) it was seized by the Crown. By the fifteenth century the castle was in the hands of David Drummond and in 1488 became the centre of a legal dispute between him and John Murray of Balloch. The legal proceedings were settled in favour of the Drummonds but a feud subsequently erupted between the two factions with a skirmish - known as the Battle of Rottenreoch - being fought between them at Knockmary (near Crieff) on 21 October 1490. The Drummonds were defeated but, in conjunction with the Campbells, mounted a surprise attack on the Murrays burning many to death whilst at church. This prompted James IV to intervene and execute the main protagonists. The dispute over ownership of Cluggy rumbled on until 1542 when the case was finally settled in favour of William Murray of Tullibardine. The castle remained a functional residence well into the seventeenth century despite a significant outbreak of plague in the area in 1645. It was occupied by Cromwellian troops during their invasion in the 1650s at which time it was owned by Sir William Murray, Baronet of Ochtertyre. In 1784 the Murrays commenced construction of Ochtertyre house as its direct replacement and the castle drifted into ruin. Castle Cluggy is situated on the ‘Dry Isle’ now completely hidden by trees. Its replacement, Ochtertyre House, can be seen in the background.